Ice skating is a wonderful activity which is practiced in a very specific environment. Ice surface, cool air, brisk movements, intense workouts, sharp blades and other conditions make it challenging for both newcomers and experienced skaters to adapt and feel comfortable on the ice. Even if you have perfect skates and great skate wear figure skating accessories are often the key to ultimate comfort. Ice skating accessories are final touches to your skating outfit. They usually include items which solve minor skating comfort issues. According to their purpose skating accessories may be classified into protective, training and beauty items. Protection of the skater. Shock-absorbing insoles, protective padding, protective headbands, hats and helmets, skating gloves, skating tights, leg warmers and other protective figure skating accessories are useful details designed to prevent strains, bruises and scratches while keeping the skater warm and safe throughout his/her practice. Ice skating wear companies design special padded shorts, shirts, gloves, sleeves and other protective ice skating accessories with application of modern materials and advanced technologies. Protection of ice skating gear. Such skating accessories as soakers, blade guards, blade wipers, lace pullers, skating bags, leather protection gels and sprays will ensure long life and lasting quality of your skates. Thus, skate soakers are one of the most useful and practical figure skating accessories. These fabric covers are intended to absorb moisture from the blades and consequently prevent them from rusting. Another common type of ice skating accessories are skate guards which are hard plastic covers attached to the blades to protect them from contact with hard surfaces other than ice. Both skate soakers and skate guards are essential maintenance equipment allowing you to keep your blades sharp and clean. Available in a great variety of brands, materials, shapes and original designs skate soakers and guards will make your life a lot easier. Training ice skating accessories include spinners, jumping ropes, skating jump training harnesses, posture trainers, stretching devices and other equipment used for off-ice training of skaters. Skating spinners are a particularly popular among other training figure skating accessories. Skating spinners are light, plastic spinning devices rectangular or round in shape used by skaters to develop their balancing and turning skills. Skating spinners are portable skating accessories allowing to practice outside ice skating rink. Beauty-related and symbolic skating accessories typically do not directly serve skating purposes. However, they create and fortify a special emotional bond with ice skating practices identifying them as an element of one’s lifestyle. Pins, bracelets, necklaces, key chains, bags and pouches, smartphone cases, scarves and other ice skating themed accessories are intended to brighten your days by reminding you of your skating time. are useful elements of skating equipment allowing the skaters to reduce injury risks, stay comfortable, improve performance, save money and feel good about the skating practices. Skating accessories are also a perfect gift to anyone who is into skating. Most ice skating accessories are one-size-fits-all and thus will certainly suit any user! FigureSkatingStore.com offers a variety of skating accessories by the leading brands at affordable prices. Check our products at FigureSkatingStore.com and you will find value for money figure skating accessories under convenient delivery terms. Ice Skating Accessories are essential for every skater because without the ice skating accessories many problems can start happening to the equipment. Ice skating equipment such as ice skates require several ice skting accessories to upkeep them in good shape. One of such accessories is skate guards. Skate guards are necessary for walking around in ice skates on top of hard surfaces, they also protect the blades from getting damaged if you step on to something metal for example. Ice skating accessories such as ice skating soakers protect ice skating blades from rusting and alos they protect other ice skating euipment and accessories from getting damaged by the sharp figure skating blade. Different figure skating tights are also considered to be an ice skating accessory and can be found in this category. Ice skating tights are very important to every professional or amature figure skater. They are very comfortable to practice in, provide warmth and protection against ice. Figure skating accessories such as bunga pads help skaters to heal their injuries as well as prevent new ones. Boot covers are also an ice skating accessory which is used to compliment and ice skating outfit by making the skates match the skating dress or ice skating pants. Figure skating accesories such as crystal laces provide extra bling while a lace tighter can help you tighten the ice skating laces. There are many ice skating accesories out there, and so many of them are very important. The more accessories you got the better the chance that your ice skating equipment will be in top shape, and that you will shine on the ice. Skating accessories are a great way to express yourself creatively as well. 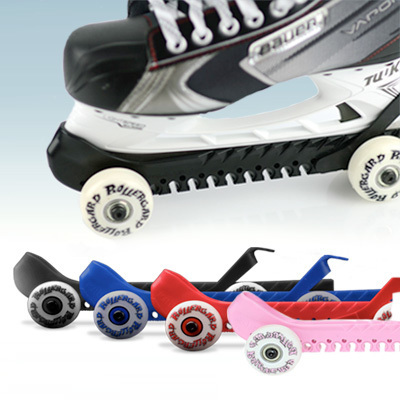 These ice skating accessories have been divided into numerous distinctive categories and have segregated products that vary in styles, color patterns, price as well as functionality, that help you conclude on the best product. These affordable skating accessories are shaped like all your child's favourite animals, in wonderful textures that not only protect their blades from extensive damage and absorb moisture, but these animal ice skating soakers also add the opportunity for your child to express themselves by being available in numerous choices. These animal ice skating soakers ensure to safeguard all the items from getting scratched or damaged inside the bag as well. 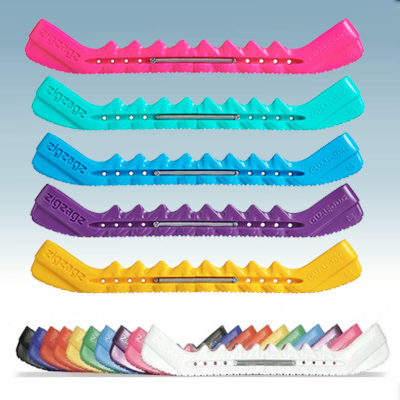 The next accessory, of durable rockers skate guards, protects your blades especially when you're on the move as they are made of the highest quality components and are also available in many colors. That leads us to the puff soft blade covers that poses all the above mentioned qualities while being soft and furry. The puff soft and furry delights also protect the skates from chipping or scratches and enable the blades from looking new as ever by preventing rusting and prolonging their sharp edges. While the exterior is covered with high grade fur, the interior of the furry soakers are lined with sickening materials to keep your blades dry. The blinking skate guards have wonderful flashing mechanics inside the blades mark a fashion statement and are designed for children who love these elements. The crystal skate guards have all kinds of wonderful features like springs and rhinestone accents. The boot covers safeguard your boots from damage due to constant usage and are made of nylon as well as Lycra that comfortably fit all its wearers and is also an amazing way to protect your skates. The fun and food soakers display various scrumptious food designs and protect your blades from getting damaged due to their puffed padded interiors. Funky soakers display an intelligent design with fun cartoon characters. The gloves and mittens are another great accessory to own, as they possess components like three special finger tips, stretchable gloves that fit beautifully with close fitting wrists for comfort, a series of rubber dots on the palm that act like shock absorbents and provide a better grip. The ice skating gloves also keep your hands warm and protect them in case of a fall. These figure skating gloves are available in your favourite colors too. Ice skating lacing boots are another essential item to own that ensure a good grip due to tier solid lacing hook, and these laces can be tucked away easily while you're not using your boots. These laces are most effective when they're used on the middle hook that enables them to be fastened easily on the outside to help keep the skates strong and comfortably tight, with long ends that ensure easy threading. Other miscellaneous accessories include scarfs and multi-functional printed head wear. The Zuca nesting pouches are another hit with customers as they're very durable, light and super easy on maintenance. Digitsole is another class apart accessory that is highly recommended for ice skaters to keep their feet warm. The ice skating tights that are available in almost every color pallets and are also adorned with fun elements like rhinestones and funky applique patterns on the side and come in wonderful mix materials. Lastly the accessories used for ice skating training aids are excellent to perfect your overall performance by ensuring ice skating training tools that correct your posture, help you perfect your spins, are great for stretching working on your moves off ice and warm up exercises.